"Random Shots" by Jelani Cobb: The congressional battle over guns. "E. U. 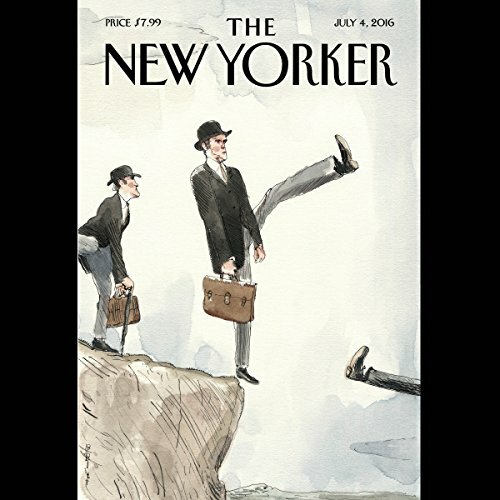 Later" by Anthony Lane: The U.K.'s decision to leave the E.U. and the voting patterns that produced it. "How to Steal an Election" by Jill Lepore: The crazy history of nominating Conventions. "Swimming with Sharks" by Rebecca Mead: Loïc Gouzer has made millions for Christie's by subjecting it to greater risk. "The Sound of Hate" by Alex Ross: When does music become torture? "Old Enemies" by Anthony Lane: Reviews of Independence Day: Resurgence and Our Kind of Traitor.